According to the source this picture was taken in May 1919 by A.P. Taylor of Milford, Surrey, U.K. The photo can be viewed in a “composite” view which gives better detail but looses the text outlining the position of each of the soldiers in the photo. This find was related to the soldier page for Lt. W.K. Rooney and if authentic is a great find. Possibly Lt. W.K. Rooney in center. 18th Canadian Battalion “D” Coy., West Ont. Regt. 5th Row, Left to Right – Pte. G. Thompson, Sgts. F. McLean, J. Leeson, J. Tuson, A. Tayles, C.S.M. J. Harper, Lieut. E.G. Barrie, Lieut. H.N. Bawden, Lieut. J.A. McMillan, Capt. D.R. Oliver, Lieut. A.H. Jones, Lieut. W.K. Rooney, C.Q.M.S. A.E. Mundy, Serfts. D.M. Ross, W.G. Burder, A.A. Drummond, V.H. Burns, Pte. H. Marshall. 6th Row, Left to Right – Ptes. R. Guerin, N. Liness, B. Poole, J. Barnard, B. Haslam, Corps. V.W. Johnson, R.B. Duncan, J.W. Laughlin, C.B. Cruickshanks, L/Corp. F. Robinson, Corp. R.W. Wilson, Ptes. B. Nicholls, J. Brandow, A. Bishop, A. Atto, G. Harper. ← Photos of the 18th Battalion? I have amended the photograph. For reference, the names attached to the photo are transcribed in their original state. I took the names off the source document. I do appreciate you correcting this record and if you have any more information regarding the soldier I would appreciate knowing more. Reg number. Is correct. Thanks for correcting this.I have some of his things from the war and the reunions after. That is in fact my grandfather William Kenneth Rooney. I have an original of the photograph. Richard, thank you for finding me here. I just wrote an article with that photo in it and was wondering if your photo indicates the date or the location of the photo? 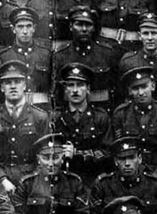 I have an 18th Battalion Facebook Group and there is a page for your Grandfather at the blog.